Carling Bassett-Seguso knows exactly what Eugenie Bouchard is going through — and what she can expect next. Eugenie Bouchard’s magical ride to the Australian Open semifinals has attracted the attention of a Canadian tennis starlet from 30 years ago. “When I heard that, I went, ‘Oh, my God. Thirty years.’ Then I thought how awesome it is that it’s happening now and how great this is for Canadian tennis,” Carling Bassett-Seguso said Tuesday in a telephone interview from Bradenton, Fla.
Bouchard, who plays No. 4 seed Li Na of China on Wednesday at 9:30 p.m. Toronto time, is only the second Canadian (male or female) ever to qualify for a singles semifinal in a Grand Slam event. The first was Bassett-Seguso at the 1984 U.S. Open. Now 46, the Toronto-born Bassett-Seguso, who was the Anna Kournikova of her day, “is excited” to see the Montreal native go for the Grand Slam title. Bassett-Seguso and Bouchard have taken similar paths, albeit 30 years apart. 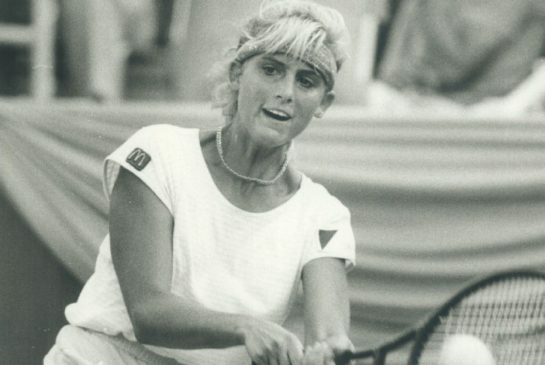 Bouchard was named the Women’s Tennis Association newcomer of the year in 2013, an honour that Bassett-Seguso captured in 1983. Both also achieved tennis success at a young age. Bassett-Seguso turned pro at 15, which she now admits was too young. Though there are now age-eligibility rules on the WTA Tour (players 18 and older can play in an unlimited number of professional events), in the 1980s there were no age restrictions on joining the tour. Bassett-Seguso climbed to No. 8 in the world, and eventually her tennis success and good looks propelled her into modelling. She was no stranger to the spotlight, having been born into prominence. Her father, John F. Bassett, owned professional football and hockey franchises and produced movies — including the teen comedy Spring Fever, in which Carling starred. But ultimately, the world wanted more from her than she was able to give. She developed an eating disorder. She now says she would have done things differently. “I don’t think I would have taken on the responsibility of Ford modelling, as much as I respect and admire their organization, because there was a lot of pressure on my body image,” she said. Bassett-Seguso notices that Bouchard, at 19, appears to be handling the big stage very well. Win or lose in the Aussie Open semifinals, Bouchard will see her ranking soar from her current No. 31 when the first Grand Slam of the year wraps up. Managing the pressure and outside interests will be key for Bouchard, Bassett-Seguso stresses. Bassett-Seguso believes that the pressure for personal appearances will escalate when Bouchard returns to Canada. Bassett-Seguso advises Bouchard to not jump too fast when offers roll in. After a short career, Bassett-Seguso wanted to start a family with her tennis-playing husband Robert Seguso. She and Seguso, who have been married for 26 years, have five children in all. They have three older children (Holden, 25, Carling, 22, Ridley, 20) and, 17 years later started, a new family with two girls (Lennon, 3 1/2, and Theodora, 2 1/2). After her tennis career, Bassett-Seguso turned to training young tennis players, picking up the racquet in the early-morning hours. Now both she and her husband are out of tennis. He works as a day trader and she is a budding writer. She has been journaling for about a year and has a strong interest in writing mysteries and screenplays. That’s her advice to Bouchard: Feel this moment.